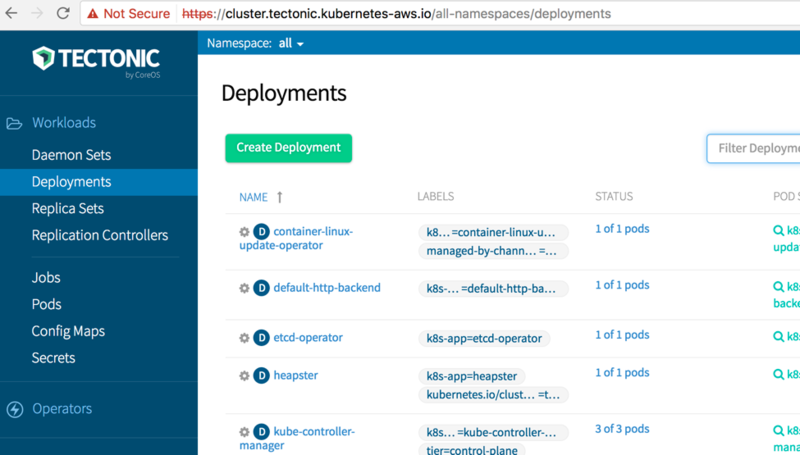 There are multiple ways to run a Kubernetes cluster on Amazon Web Services (AWS). The first post in this series explained how to manage a Kubernetes cluster on AWS using kops. 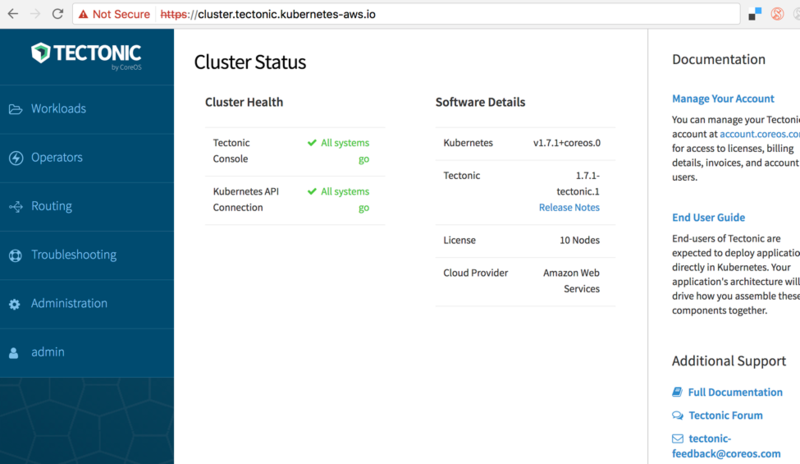 This second post explains how to manage a Kubernetes cluster on AWS using CoreOS Tectonic. Comes with a graphical installer that installs a highly available Kubernetes cluster. Alternatively, the cluster can be installed using AWS CloudFormation templates or Terraform scripts. An operator is an application-specific controller that extends the Kubernetes API to create, configure, and manage instances of complex stateful applications on behalf of a Kubernetes user. This release includes an etcd operator for rolling upgrades and a Prometheus operator for monitoring capabilities. A web console provides a full view of applications running in the cluster. It also allows you to deploy applications to the cluster and start the rolling upgrade of the cluster. Node CPU and memory metrics are powered by the Prometheus operator. The graphs are available in the console. A large set of preconfigured Prometheus alerts are also available. Tectonic ensures that cluster is always up to date with the most recent patches/fixes. Tectonic clusters also enable role-based access control (RBAC). Different roles can be mapped to an LDAP service. CoreOS provides commercial support for clusters created using Tectonic. 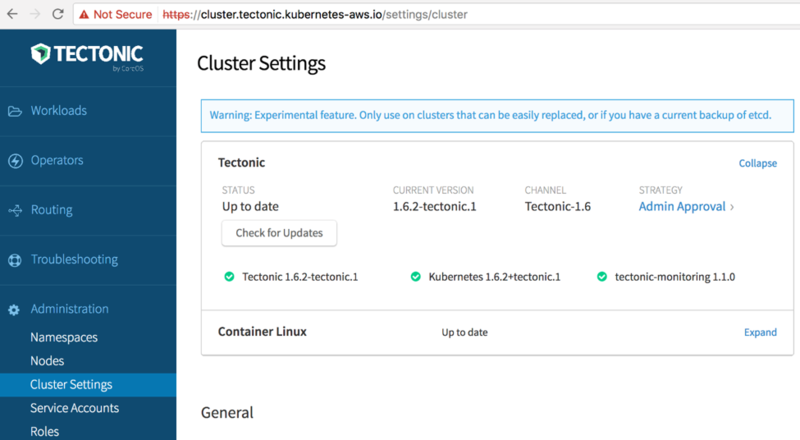 Tectonic can be installed on AWS using a GUI installer or Terraform scripts. 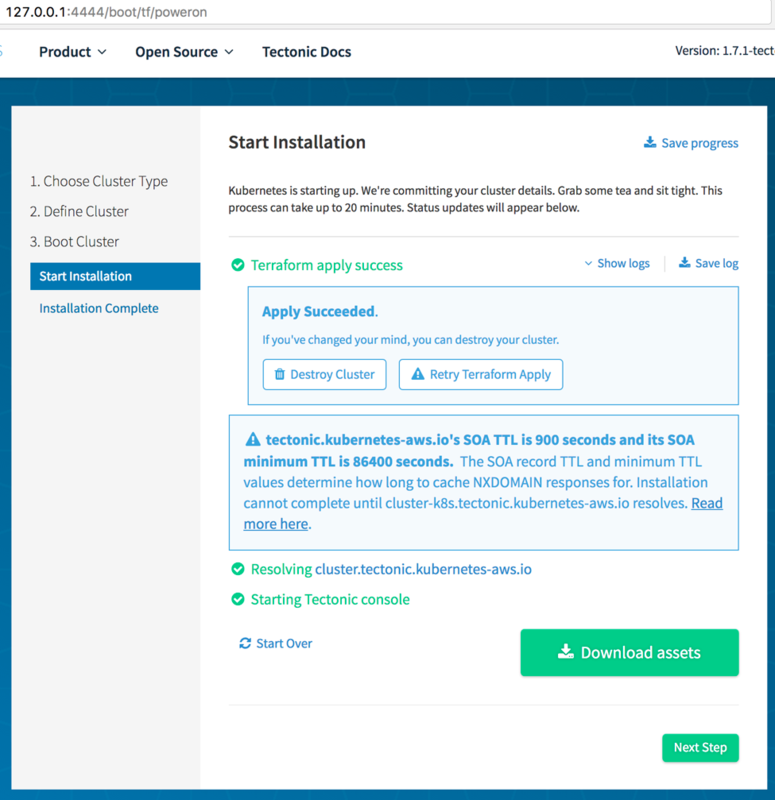 The installer prompts you for the information needed to boot the Kubernetes cluster, such as AWS access and secret key, number of master and worker nodes, and instance size for the master and worker nodes. The cluster can be created after all the options are specified. Alternatively, Terraform assets can be downloaded and the cluster can be created later. This post shows using the installer. Even though Tectonic is a commercial offering, a cluster for up to 10 nodes can be created by creating a free account at Get Tectonic for Kubernetes. After signup, a CoreOS License and Pull Secret files are provided on your CoreOS account page. Download these files as they are needed by the installer to boot the cluster. Use the aws-policy policy to grant the required permissions for the IAM user. A subdomain is required to create the cluster, and it must be registered as a public Route 53 hosted zone. The zone is used to host and expose the console web application. It is also used as the static namespace for the Kubernetes API server. This allows kubectl to be able to talk directly with the master. The domain may be registered using Route 53. Alternatively, a domain may be registered at a third-party registrar. This post uses a kubernetes-aws.io domain registered at a third-party registrar and a tectonic subdomain within it. The bottom of the screenshot shows NS records configured for the subdomain. Replace $PLATFORM with either darwin or linux. The installer opens your default browser and prompts you to select the cloud provider. Choose Amazon Web Services as the platform. Choose Next Step. Specify the Access Key ID and Secret Access Key for the IAM role that you created earlier. This allows the installer to create resources required for the Kubernetes cluster. This also gives the installer full access to your AWS account. Alternatively, to protect the integrity of your main AWS credentials, use a temporary session token to generate temporary credentials. You also need to choose a region in which to install the cluster. For the purpose of this post, I chose a region close to where I live, Northern California. Choose Next Step. Give your cluster a name. This name is part of the static namespace for the master and the address of the console. To enable in-place update to the Kubernetes cluster, select the checkbox next to Automated Updates. It also enables update to the etcd and Prometheus operators. This feature may become a default in future releases. Choose Upload “tectonic-license.txt” and upload the previously downloaded license file. Choose Upload “config.json” and upload the previously downloaded pull secret file. Choose Next Step. Let the installer generate a CA certificate and key. In this case, the browser may not recognize this certificate, which I discuss later in the post. Alternatively, you can provide a CA certificate and a key in PEM format issued by an authorized certificate authority. Choose Next Step. Define the number and instance type of master and worker nodes. In this case, create a 6 nodes cluster. Make sure that the worker nodes have enough processing power and memory to run the containers. (Default) Provision the cluster using EC2 instances. Additional EC2 instances are used in this case. Use an alpha support for cluster provisioning using the etcd operator. The etcd operator is used for automated operations of the etcd master nodes for the cluster itself, in addition to for etcd instances that are created for application usage. The etcd cluster is provisioned within the Tectonic installer. Bring your own pre-provisioned etcd cluster. Use the first option in this case. For more information about choosing the appropriate instance type, see the etcd hardware recommendation. Choose Next Step. Specify the networking options. The installer can create a new public VPC or use a pre-existing public or private VPC. Make sure that the VPC requirements are met for an existing VPC. Give a DNS name for the cluster. Choose the domain for which the Route 53 hosted zone was configured earlier, such as tectonic.kubernetes-aws.io. Multiple clusters may be created under a single domain. 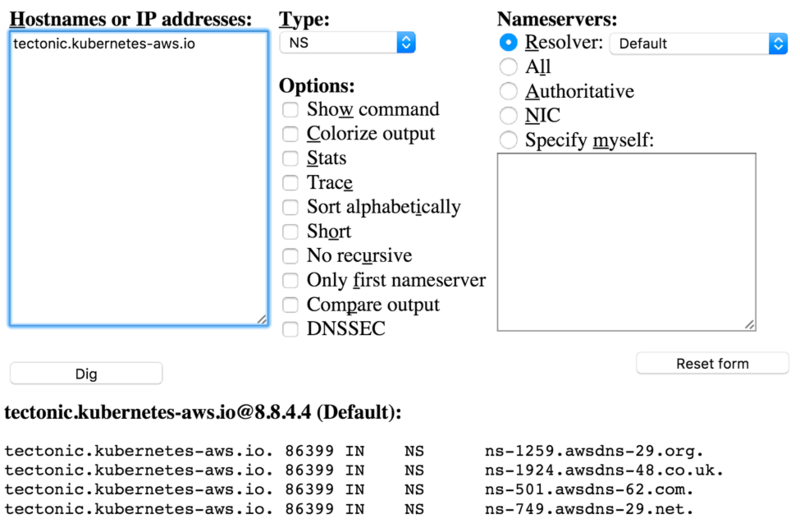 The cluster name and the DNS name would typically match each other. To select the CIDR range, choose Show Advanced Settings. You can also choose the Availability Zones for the master and worker nodes. By default, the master and worker nodes are spread across multiple Availability Zones in the chosen region. This makes the cluster highly available. Leave the other values as default. Choose Next Step. Specify an email address and password to be used as credentials to log in to the console. Choose Next Step. At any point during the installation, you can choose Save progress. This allows you to save configurations specified in the installer. This configuration file can then be used to restore progress in the installer at a later point. To start the cluster installation, choose Submit. At another time, you can download the Terraform assets by choosing Manually boot. This allows you to boot the cluster later. The logs from the Terraform scripts are shown in the installer. When the installation is complete, the console shows that the Terraform scripts were successfully applied, the domain name was resolved successfully, and that the console has started. The domain works successfully if the DNS resolution worked earlier, and it’s the address where the console is accessible. Choose Download assets to download assets related to your cluster. It contains your generated CA, kubectl configuration file, and the Terraform state. This download is an important step as it allows you to delete the cluster later. Choose Next Step for the final installation screen. 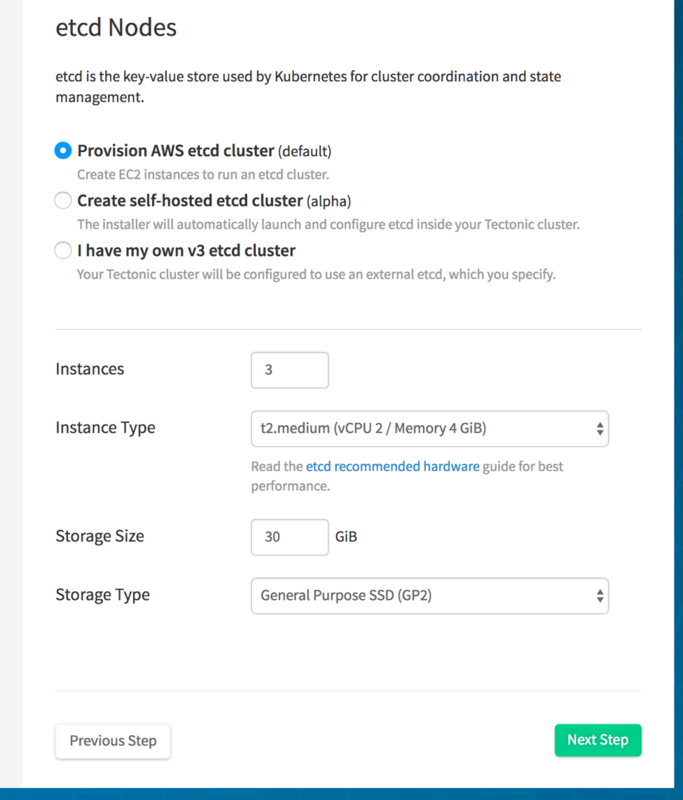 It allows you to access the Tectonic console, gives you instructions about how to configure kubectl to manage this cluster, and finally deploys an application using kubectl. Choose Go to my Tectonic Console. In our case, it is also accessible at http://cluster.tectonic.kubernetes-aws.io/. As I mentioned earlier, the browser does not recognize the self-generated CA certificate. Choose Advanced and connect to the console. Enter the login credentials specified earlier in the installer and choose Login. The Kubernetes upstream and console version are shown under Software Details. Cluster health shows All systems go and it means that the API server and the backend API can be reached. To view different Kubernetes resources in the cluster choose, the resource in the left navigation bar. For example, all deployments can be seen by choosing Deployments. By default, resources in the all namespace are shown. Other namespaces may be chosen by clicking on a menu item on the top of the screen. Different administration tasks such as managing the namespaces, getting list of the nodes and RBAC can be configured as well. It can also be conveniently installed using the Homebrew package manager. To find and access a cluster, Kubectl needs a kubeconfig file. By default, this configuration file is at ~/.kube/config. This file is created when a Kubernetes cluster is created from your machine. However, in this case, download this file from the console. In the console, choose admin, My Account, Download Configuration and follow the steps to download the kubectl configuration file. Move this file to ~/.kube/config. If kubectl has already been used on your machine before, then this file already exists. Make sure to take a backup of that file first. This output is similar to the one shown in the console earlier. Now, this kubectl can be used to manage your resources. Tectonic allows the in-place upgrade of the cluster. This is an experimental feature as of this release. The clusters can be updated either automatically, or with manual approval. Choose Check for Updates. If any updates are available, choose Start Upgrade. After the upgrade is completed, the screen is refreshed. This is an experimental feature in this release and so should only be used on clusters that can be easily replaced. This feature may become a fully supported in a future release. 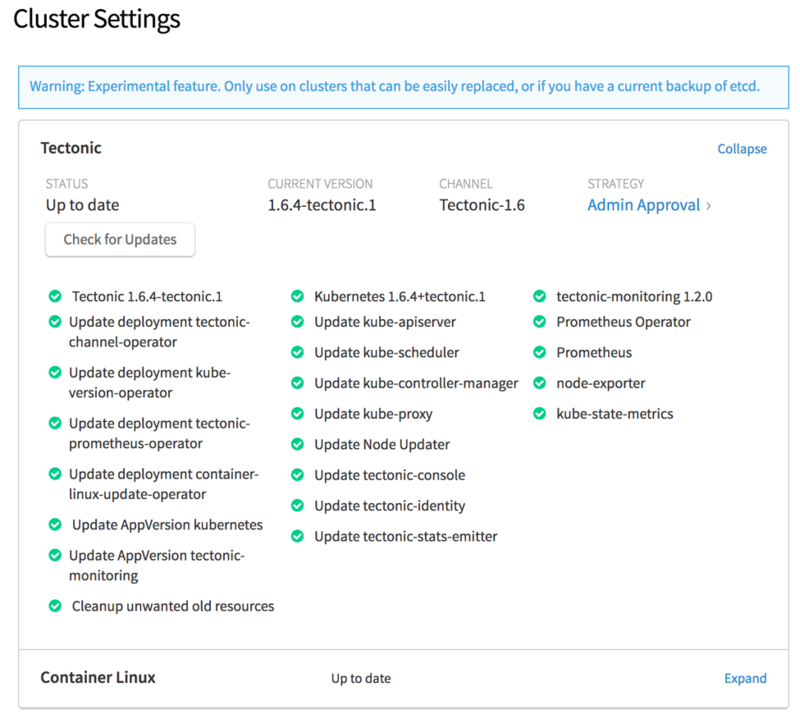 For more information about the upgrade process, see Upgrading Tectonic & Kubernetes. Typically, the Kubernetes cluster is a long-running cluster to serve your applications. After its purpose is served, you may delete it. It is important to delete the cluster as this ensures that all resources created by the cluster are appropriately cleaned up. This destroys the cluster and all associated resources. You may have forgotten to download the assets. There is a copy of the assets in the directory tectonic/tectonic-installer/darwin/clusters. In this directory, another directory with the name <cluster-name>_TIMESTAMP contains your assets. 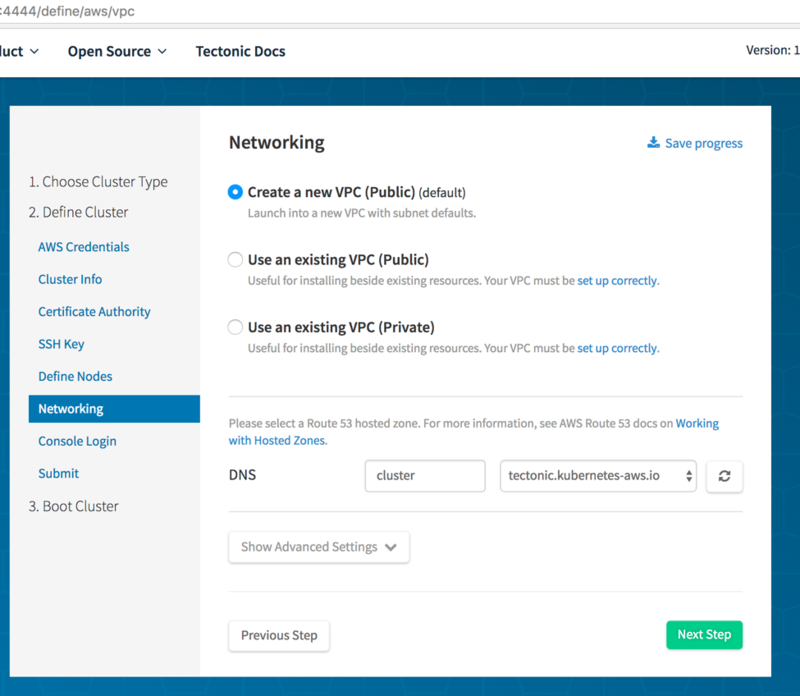 This post explained how to manage Kubernetes clusters using the CoreOS Tectonic graphical installer. For more details, see Graphical Installer with AWS. If the installation does not succeed, see the helpful Troubleshooting tips. 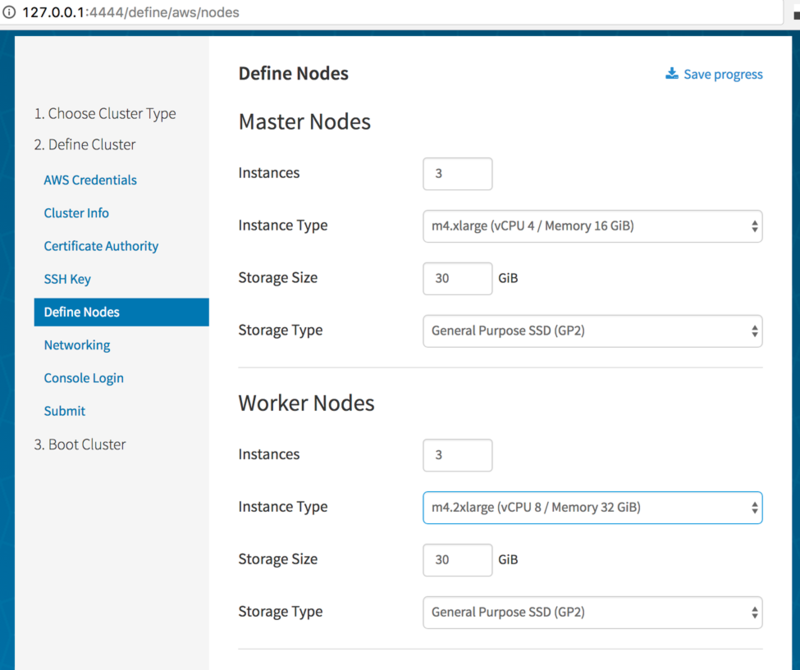 After the cluster is created, see the Tectonic tutorials to learn how to deploy, scale, version, and delete an application.